Read this book review of The Value Investors by Ronald Chan! So is Value Investors all it’s cracked up to be? Well, the truth is, I was headed to the beach and needed some light reading. So this compilation of value investors biographies and interviews seemed like it would fit the bill. In this book review you’ll see how this little reading day at the beach turned out. I’ll tell you what I liked about The Value Investors, as well as where it came up short. That way you can decide if this is the right finance book for you. 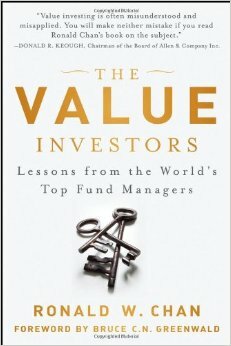 The Value Investors is much like Market Wizards, in that it features one prominent investor per chapter. As I was hoping for, this made the book pretty easy to read. If you have to commute to work and need something that doesn’t require concentrated focus for one chapter after another, this book would be great for you. The Value Investors is easy to read. And some of the individuals that are interviewed and featured in the book are very prominent personalities, within the value investing community. If you’ve read the Appendix in, “The Intelligent Investor” you’ll recognize a lot of these names. It was great to get these perspectives in an easy to digest format. While there are lots of stock market biographies, this book does a good job gathering up a diverse and global contributor base made of leading value investors. And leaders they are. This book interviews a number of investors who have made double digit returns for decades on end. It’s really quite incredibly. (1) First, this book features a great cast of characters. I would have bought it just for the interviews with Walter Schloss and Irving Khan. (2) Second, this book features a global array of value investors. It does a great job illustrating the different approaches to value investing that exist around the world. It’s insightful to get these perspectives that you otherwise might not have seen. The Value Investors is a little bit of a light read. While there are definitely a ton of educational tidbits sprinkled throughout the book, it’s by no means methodical or comprehensive. You won’t learn how to do value investing from this book. It’s great supplemental knowledge. And there are some big hints about how these prolific investors value companies. But I’m not convinced you’ll have a light bulb moment either. All that said, I really enjoyed reading The Value Investors. And if you’re looking for interesting and insightful biographies of some of history’s time tested value investors, you will too. So let’s wrap this up. The Value Investors is a great book that describes the approaches to life and investing of many of history’s most successful value investors. All of the investors featured in this finance book have decades of experiences outperforming the stock market. It’s for that reason that I recommend you buy The Value Investors on Amazon if you’re curious. They usually have a pretty good discount. If you’re looking for more information on The Value Investors, I encourage you to check out the video book review below. This entry was posted in Stock Ideas and tagged investment book reviews, valu on August 13, 2014 by Jworthy.